One of the most difficult things I have to do at work is negotiate lunch once or twice a week. You would think that I would have a hard time getting them to pick somewhere that offers #GF food. But, that isn’t it at all. I have a harder time getting them to chose something that doesn’t have a drive-thru window on the side of the building. I work in the middle of down town Milwaukee. We are surrounded by a wide array of Amazing restaurants. When the discussion for lunch comes up on Thursday or Friday afternoons my co-workers usually suggest one of the following – Panda Express, Potbellies, Chipotle, Jimmy Johns or Dominoes. I try, over and over again to get them to try one of our great local restaurants. But, every week I fail. But, today there was a break through…..for them, not really for me. We are getting lunch from Noodles & Co. And, they are so proud because there is one dish on the menu I can order! 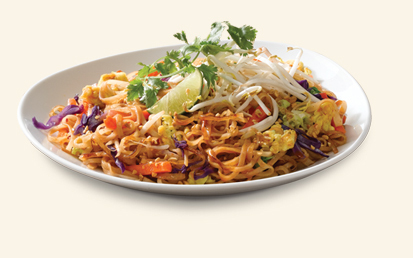 So, I will be participating and smiling along as I eat my Pad Thai with Shrimp for lunch. I am determined to get them to realize what great food this city really has to offer!! Not sure I would have chose to write about my love for all things movie theater, but since I am back in school and need to get some blog posts in, movie theater snacks it is. I grew up going to the movies. Almost every weekend involved a movie theater, bucket of popcorn, soda and candy. Now, that I am in my mid-30’s nothing has changed. I love nothing more than sitting in a theater and getting lost in the big screen. Most of the time I could care less what movie it is. 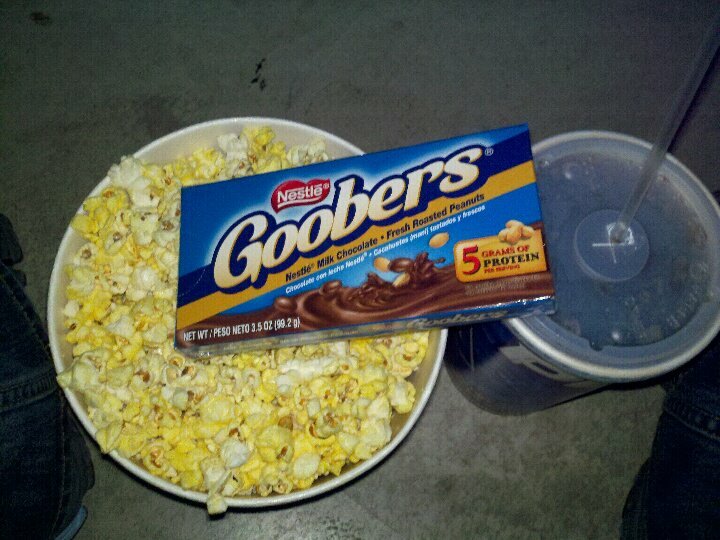 As long as I get my bucket of popcorn, soda (sometimes an Icee) and a box of candy (either Goobers or Whoppers). I cannot honestly say I never remember watching a movie without having all three of those things. I also need to enter the theater on the right if possible, sit in the middle more than half way back and on the right side of whoever I am with, but that is a whole other issue. This is one picky eater habit that I don’t plan on changing any time soon. I have gotten fairly lazy with my eating lately, so it is time to pick things up again. My first new adventure is going to be quinoa. I have heard nothing but good things about it. Savory or Sweet….there is a place for it in every meal. Gluten-free-ians, vegetarians and vegans will often go on about quinoa being a super food. I love its taste and have used it to replace wheat in lots of dishes… so thought it was time to do some research. Quinoa a “pseudocereal” rather than a true cereal, or grain, as it is not a member of the grass family. It is actually closely related to species such as beets, spinach AND tumbleweeds! OK….after watching this episode of Dr. Phil, on a level of Crazy to Normal, I am definitely slightly toward Normal. That certainly makes me feel better. Cucumbers do not cause the same reaction as Vick’s Vapor Rub. I find it funny that french fries are a common theme among pick eaters. Much like these woman my picky eating started when I was young and we just never grew out of it. Mostly because we didn’t have to. An Entire Meal and No Photos! Since getting connected on Social Media and starting this blog I am usually that person at the table next to you taking a photo of every meal I eat. Especially if it is something I have never tried before. This past weekend, for the second time in 2 months since they opened, I went to Odd Duck in Bay View. The specialize in small plates of locally sourced ingredients, with an ever changing menu. This time last year I may not have even considered eating at a place like this, with most of their plates including vegetables and sauces I can barely pronounce. The first time I went there were 4 of us and we shared 11 small plates between us. The stand out dish of the entire night were the Gouda-stuffed Medjool Dates wrapped in bacon with Balsamic. There is no way in my recent past would you have been able to get me to put a date in my mouth, much less sit at home and salivate over the thought of when I would get to eat them again. Although Odd Duck is constantly changing their menu, I certainly hope the dates don’t go anywhere for a while. This last time I went, the Bacon-wrapped Scallops where my Must-try! I can’t recall ever having eaten a scallop before. With such great experiences with their other dishes, I thought Odd Duck was the best place to give them a try. I didn’t really know what to expect, but I expected them to be a bit fishy tasting and rubbery. I was pleasantly surprised. They were not fishy tasting at all and seemed to melt in my mouth. Notice the common theme between the two dishes….Yes, bacon wrapped. Is anything not Delicious that is wrapped in bacon. My goal will be to get back to Odd Duck soon and actually get some pics of the great food I have had there. They also have a bar selection of different things they pickle in house. 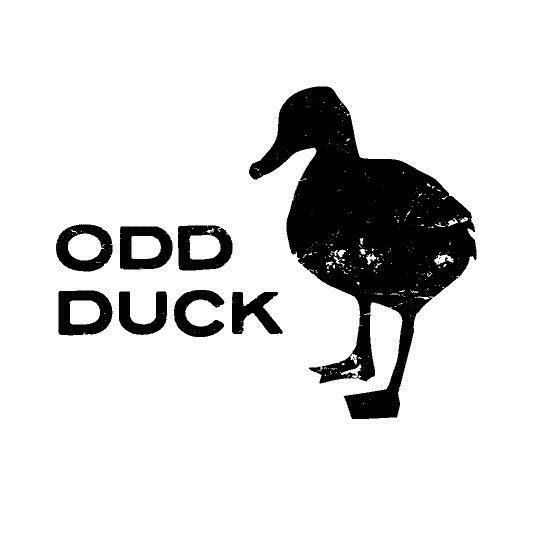 A quick shout out to Odd Duck for being Gluten Free friendly. The first time I went I emailed a head of time to ask if they had a separate gluten free menu. She explained that they were working on it, but gave me a list of foods that were safe and where they could make substitutions. This second time I went, I asked again and was given a separate menu with all of the gluten free and plates able to be substituted marked. Anyone that knows me, knows that I am a sucker for anything labeled, “As Seen on TV”. If it is Buy One, Get One Free it is pretty much a done deal. Over the years I have had The Perfect Pancake pan, the Microwave Omelet Maker, the Jimmy Buffet Margaritaville Margarita Maker, the Jack LaLanne Juicer, The Magic Bullet, a Snuggie (even my dogs have Snuggies), the Forever Lazy, and on and on and on. Most of the time things don’t work like they show on TV, but every once in a while you come across goodies like the Forever Lazy, and you don’t know how you lived without it. Which is exactly what keeps me going back for more. The fact that most stores now have a “As Seen on TV” section, my obsession is easier to manage. Or, harder, depending on how you look at it. 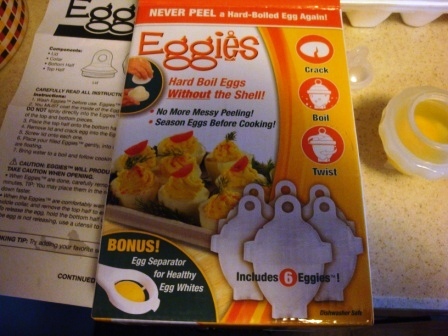 My most recent purchase……Eggies!! Just last week I was complaining to a group of people that whenever I make hard boiled eggs, the peels always come off in tiny pieces. 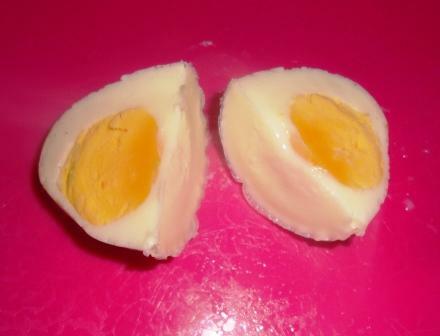 One hard boiled egg after another, and I can not figure out how to cook them and have their peel come off easily. While walking through Walgreens yesterday I saw the perfect solution……Eggies!! They give me the ability to hard boil eggs WITHOUT the shell! OMG……Perfect!! First out of the box I needed to wash the Eggies, then coat them with non-stick spray. The instructions say not to spray directly on the Eggie, but rather spray a napkin and wipe the interior of the Eggie. 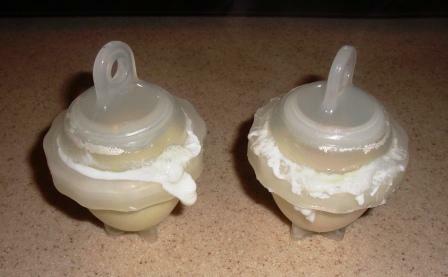 Then I placed the top and bottom together, leaving the lid off. I had to crack the egg directly into the top of the Eggie, while trying not to spill any. (That was the hard part!) The hole is pretty small, so some of the egg whites ended up on the counter top. Then I sealed them up tight! They looked like little space ships filled with egg. 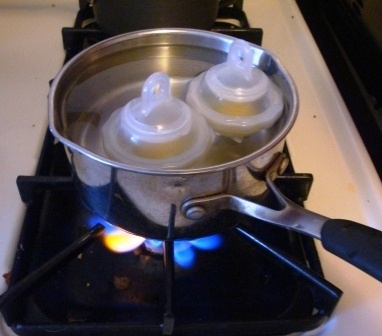 The next step was to boil them just like a regular egg. I put them in a pan of water, ensuring that they were floating. Bring the water to a boil and cook for 15 mins. for a hard boiled egg. Almost immediately I could tell there wasn’t a tight seal on the Eggies. I could see little streams of egg whites leaking out of the Eggie and into the water. I left them in the water to see what would happen. After 15 mins I pulled them out and let them cool on the counter. 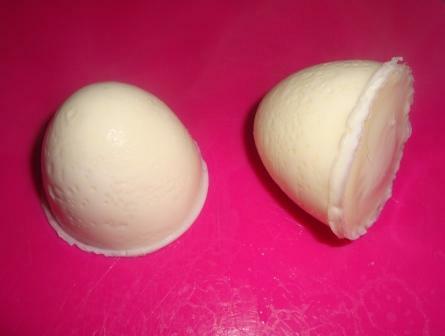 There were egg whites around the middle seal of the Eggies. When I opened them up I was surprised to find that they actually worked! But, rather than it being a hole egg in the shape of the Eggie, they were flat on top where the egg has leaked up at the seal. 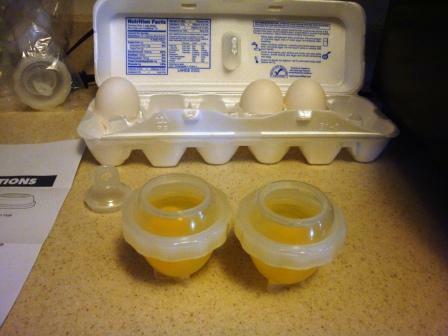 Technically, the Eggies worked, minus the leakage of half of the egg whites out of the shell. But, I don’t think I can say it was easier than just boiling an egg in the shell. On to the next “As Seen on TV” product! So…today is my birthday and I was given the option to have dinner anywhere I chose. In the last year I have been to restaurants all over Milwaukee with Yelp and #MKEFoodies, and have been opening myself up to all different kinds of food. I checked out my list of foods that I wanted to try in hopes of coming up with a birthday dinner idea. Did I want to go to Maxie’s Southern Comfort and try the oysters? Did I want to go to Triskele’s and try the mussels? Did I want to go back to Capital Grille for a nice dry aged steak? Nope…I didn’t want any of that fanciness. I just wanted some good, old fashioned, comfort food. It doesn’t get any more comfortable than a double cheeseburger (no onions or pickles), fries and a cup of the chicken flavored noodle soup from George Webb. So, this 35th birthday, I didn’t want any fancy pants dinner. I just wanted what I knew would make my taste buds and my belly happy! 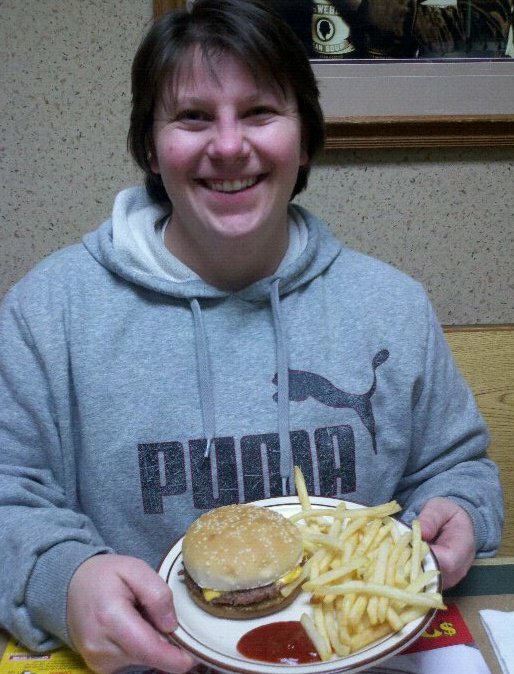 Thank You George Webbs for always being there! !